24 Months|105 Weeks|17250 Hours is a blog by Julianne Brienza, CEO/Founder of Capital Fringe based in Washington, DC. Posting running through August 2020 will explore the varied aspects of defining the organizational evolution and structure of a annual Fringe festival to a year round organization through photos and narrative. 24 months|105 weeks|17520 hours Re-defining of the definition of Fringe beyond an annual festival. Sep 1 What is this? This is a robust story. In creating and sustaining Fringe for thirteen years I have experienced serious peaks and deep valleys. I want to give you the most useful framework to understand the posts that will appear on this site. Some of you may have volumes of knowledge of what Fringe has been. You might have loved Fringe, or hated Fringe. Some may just be learning about Fringe. Whomever you are, welcome. 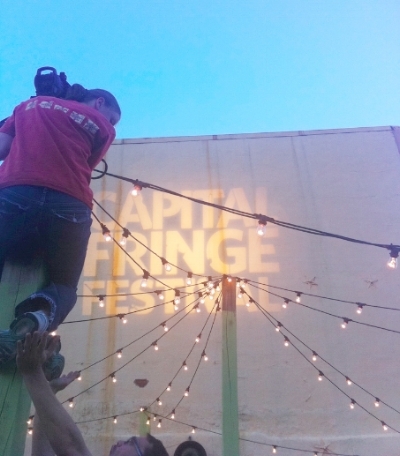 Christine Yackee climbing a pole at Fort Fringe to insert our first ever logo gobo in 2009. Jose Abraham with his hands stretched up in case Christine were to fall. A ladder should have probably of been used. In 2008, Capital Fringe moved into a 22,000 sq ft building in Northwest DC on a handshake and an agreement to pay $5000 per month. We named the property Fort Fringe. During the eight years that we occupied this unique property we tarred roofs, ran a parking business, killed rats, built three theaters (Shop-100 seats, Bedroom-40 seats, Redrum-80 seats), painted murals, and supported and trained thousands of individual artists and companies. It was a once in lifetime opportunity that was seized vigorously. We all had the best and worst of times. Poseidon standing tall with one of the three Bladacchino tent tops at Fort Fringe in 2009. One of our most iconic organizational structure creations and the one that made the most significant impact during our eight years at Fort Fringe was the Baldacchino Tent Bar. A 3000 sq ft tented bar with old doors as the walls that contained an 80-seat theatre, full bar, patio and sidewalk seating and was the first official bar/restaurant in DC to serve prosecco on tap. 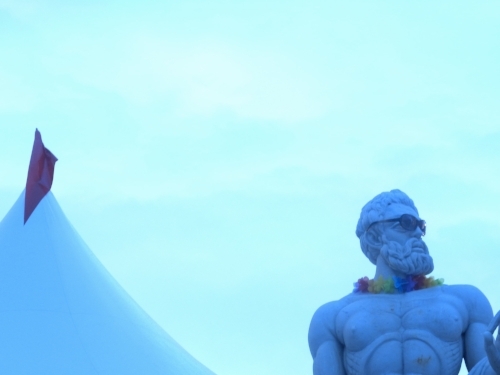 All were watched over by a large statue of Poseidon positioned in the middle of the parking lot. This photo is from our paint pour themed year in 2012. The weight of the days being numbered at the Fort were heavy. Pouring paint over everything, including people seemed the proper response to the weight. Cory Ryan Frank pouring and Ebony Dumas getting poured onto. In 2012, the search for a more permanent property began. It was never the intent to purchase a building. However, the lowest rental price we were quoted during our search was $35 a sq ft. Obviously, outlandish to contemplate to add as a monthly expense, even with 75% earned revenue. In 2013, an article was written about our search in the Washington Business Journal. The owners of the for-profit commercial art gallery CONNERSMITH located at 1358 Florida Ave NE reached out regarding the search. After much negotiation, we issued CONNERSMITH with an LOI to rent where within we requested the option to lock in the purchase price payable in five years. CONNERSMITH was thrilled with the prospect that we were considering a purchase. At this point, it was quite apparent through working on our business plan that we would never be able afford to rent any property at that the size our programs would demand or allow for any growth. But were we able to purchase? 1358 Florida Ave NE was a perfect property with a great vibe. The once two-floor, three parcel auto detailing shop then turned art gallery, boasted 9314 sq ft of indoor space with an additional 2400 sq ft of outdoor space for a total floor plan of 11,714 sq ft. The property is zoned C-2A and has a FAR (floor to area ratio) of 19,000 sq ft for future expansion. Good solid bones, no columns, no rats or leaks and most importantly a spot where we could, given time and funds evolve into what I had dreamt up many, many years ago. A year-round identity evoloved out of the annual Fringe Festival. How did we finance building acquisition to construction? In June 2014, Fringe agreed to purchase 1358 Florida Ave NE for $4,500,000, putting down a $350,000 non-refundable deposit to secure the space until closing in October of that year. This was a true shot in the dark. We did not have the securest path to close. Getting the money straight to close was insane. This photo was taken at the point the funds were in the bank ready for transfer. Left to right, Peter Korbel, Alex Engel, Julianne Brienza, Ebony Dumas. Fringe closed on the building on October 6, 2014, paying $1,950,000 with take back seller financing for $2,550,000 in outstanding debt with a 4% interest only rate in 2015 and 6% in 2015. Additionally, the deal required another $500,000 payment in February 2015 resulting in $2,050,000 debt financing over the next two years. A more reasonable financing agreement was a critical need. Since we were on solid financial footing, and a new asset on its balance sheet, the next two years were spent arranging bank financing with a loan from our bank (PNC) in the amount of $2,206,518. Fringe received one loan for $1,200,000 with a fixed rate of 3.9% (interest and principle) and a maturity of seven years and a second loan for $1,006,518 with a floating rate equal to 3.25% (interest only) minus the prime rate (currently .10) and a maturity of five years. An additional $3,500,000 was required to move forward with construction. Currently we are $800,000 away from achieving this goal. In 2018, we are finalizing a strategic plan that is adding and furthering the manner in which Fringe makes decisions. Also, bringing into sharper focus the inflows of capital revenue and the required outflows of construction and overhead expenses. I invite you to join in on the evolution. Attend community meetings, reach out with ideas of collaborations, partnerships or support and assistance. Subscribe to the Fringe monthly email or just read this blog written by me, Julianne. Blog entries will be published every other week starting September 22. That is 51 entires in toll over 24 months. Why 24 months? Well, admittedly I researched various forms of metamorphosis as a way to mentally prepare myself for this phase in the project. The one that has stuck with me as a guide is the Butterfly School. I have broken the next twentyfour months into the following four cycles: Egg: Sept 18' - Feb 19'; Larva: March 19' - Aug 19'; Pupa: Sept 19' - Feb 20'; Adult: March 20' - Aug 20'. Yes, our "host plant" is 1358 Florida Ave NE.